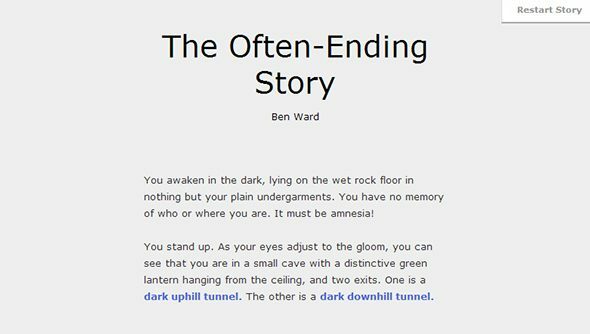 Take a look at this fun bit of interactive fiction from the mind and fingers of Ben Ward, whose overpowering Ben-ness you may recognise from comedy point and click adventures Ben There, Dan That and Time Gentlemen, Please!. It’s called The Often-Ending Story and frames you as the amnesia-addled hero of a short and surreal Twine adventure that is, in Ben’s own words, “a broad and directionless low fantasy parody with some gaming tropes thrown in”. He’s taken the best description of his work for himself there, leaving me with nothing to do besides repeat my suggestion that you play the thing. It’s funny, and short enough that to divulge much of what’s in there would rob it of a not-insignificant bit of charm. Suffice to say you can wee into a bucket at one point, which is pleasant on a number of levels. The Often-Ending Story was originally intended to be a printed choose-your-own-adventure in the Idle Thumbs GDC Newspaper, writes Ward, but following the paper’s cancellation he decided to revive his story of piss-buckets and wenches online, for all of us to enjoy.